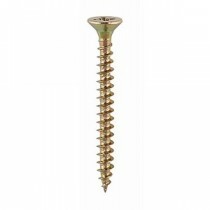 A single thread woodscrew mainly used in various types of timber and man-made boards or into masonry with a plastic plug. Special Thread Configuration gives ultimate performance and high pull-out resistance. Fully threaded up to 70mm. 25° Sharp Point for easy penetration into wood, MDF, chipboard, plastics and thin sheet metal.